As I sat at a table in Adam’s yard enjoying some most unusual yet delicious food, I realized how lucky I am to have been affiliated with the Shell Point Sailboard Club over the years. My son,Windham, was about three when he would ride on the front of my board at Shell Point, that was 25 years ago. I was skinnier the beach was bigger and it got pretty crazy. Shell Point has gone from a swinging resort marina to the homes of wealthy recluses. Its good to see all the members, that now that their kids are grown, have come back to the club. Special thanks to all the club members that no longer sail but continue to assist at our many events. Many of the folks I consider friends are because of my association with the club, folks form the previous century Tina, Wright, Paul, Hugh, Danielle, Andy (last name) and Deb who first turned me on to the SPSC and many others. This millennium has introduced me to our new pioneers Bill, Adam, Gretchen and Robin, bill, Bob, Rik, and Charlie. Another amazing Wind Ceremony in the books. The Swami’s aura resonated through the crowd. The weather gave to the Swami’s power and cleared for a wonderful evening celebration. Special thanks to the band and the incredible effort they put forward for a soul stirring performance. It was also nice to reconnect with some lost souls that are looking rejoin the club. 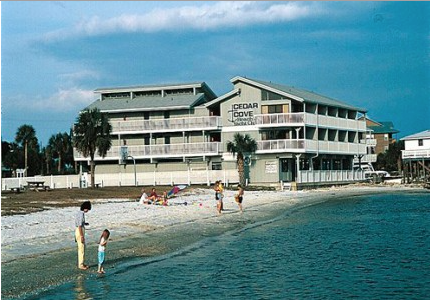 The 2016 will be held in beautiful Cedar Key this year. Wright has reserved 12 units at the Cedar Cove resort. The date will be Fathers day weekend, June 17th through the 19th. The rooms are vary reasonable and we are right next to a beach to sail from. I have only been to Cedar Key once as a quick side trip and really looking forward to enjoy enjoying this trip with Terry as it has been far to long since I attended a NIMBY event. Windsurfing Clinic with Ari Aukes! This will be a fun interactive event for all levels of windsurfers and windsurf enthusiast! Enjoy the beautiful setting of Banana River Resort, placed perfectly between the Banana River Lagoon and the Atlantic Ocean for optimal water activity year around. Learn to jibe, tack, and get better in jumping or take your freestyle/ wave skills to the next level from a PWA professional. 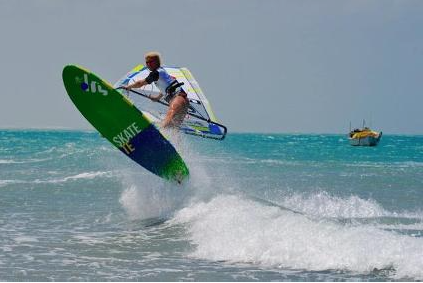 Arrianne Aukes is an experienced instructor in all windsurfing disciplines including beginner, slalom, freestyle, and waves. The clinic will include a Thursday night welcome party, followed by three days of coaching and video analysis. 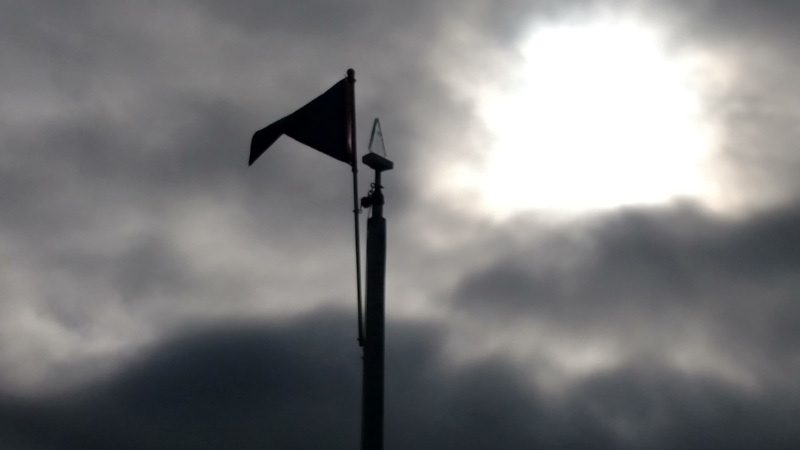 Another successful wind ceremony has come and gone. I want to thank all those people who worried whether it would rain or not because your worrying kept the rain away. It was great to see Lee back on his feet with a front row set at the concert! The festoons, comprised of Chuck Kohlhagen aka Swami, Donna McMahon, Richard Hill, Perry Morris, Paul Hansard, Tina Mazanek, Don Franklin, Sharman Franklin, Jack May, Dave Denmark, Adam Bennett, Bradley White, Bob Graves, Brian Leger, and Rick Knerr, put in many nights of practice to get ready. What is unseen, like at so many events, is the work that went into making the concert a success, with Rick Knerr, Joe Sisson, John Gilbert, Bill Olson, Bob Graves, and Wright Finney showing up at the beach between one and two pm to get started. Eleven speakers were setup for the crowds listening pleasure and five monitors were setup so the band knew what was going on. The sound board was set away from the stage on a platform to get the right mix. Power was run from the chase to supply the needs of the amplification and the individual instruments as well as the need to keep food warm over on the buffet line. We are talking about accommodating about 50 power plugs. Holes were dug for the light poles which were drug out from the chase, tested, and adjusted as were the myriad of tables used for the food. All this enabled most of the band members to just plug in and tune up (I know, some folks forgot this step) when they arrived and for attendees to salivate over all the wonderful food laid out. These same people, after setting all this stuff up, were still there to break it down and put it away nine to ten hours later. A separate thanks to Joe Sisson for chairing this event and who opened the registration table at 3pm, immediately seeing a swarm of people wanting shirts and getting their pre registrations. 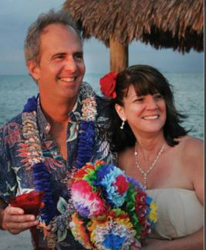 Joe was assisted by Terry Graves and off and on by Sandy Layne. There were only a handful of shirts left, but I imagine they will be gone after the next club meeting. 1. Move all of the older teaching boards and kayaks from underneath the trailer. 2. Remove the latticework skirting from around the lower part of the trailer. 3. Pressure wash and wire-brush the underside metal frame of trailer. 4. Paint the trailer metal frame with POR-15, an automotive rust-proofing coating. 5. Build some simple racks under the trailer to organize the teaching boards. 6. Replace the lattice work. 1. Pressure wash the exterior sides and front and back of the trailer, as well as the doors. 2. Look over the trailer and repair and holes, gaps, etc., with caulk. 3. Re-paint the blue-gray sides and the white trim and doors. 4. Other repair/maintenance tasks, as needed. We got all of the pressure washing done on Saturday so that we could start painting on Sunday; thanks to Perry and Bob for the use of their pressure washers. Pressure washing and painting the exterior was straightforward, but washing/painting of the underside of the trailer frame proved to be a pain in the neck (literally). The subterranean work crew (AKA the Moles – mainly Rik E. and Joe, with Bob G. and WCF) as well as several of the exterior painters became acquainted with the mouse colony that has taken up residence under the trailer; they were somewhat miffed that we were disturbing their squatters abode with our pressure washers and paint. As the day wore on, there were fewer and fewer folks who had the use of both hands (one was occupied grasping a beverage), but everything was completed about 5:00 pm. Perry graciously provided martinis afterwards for those so disposed. 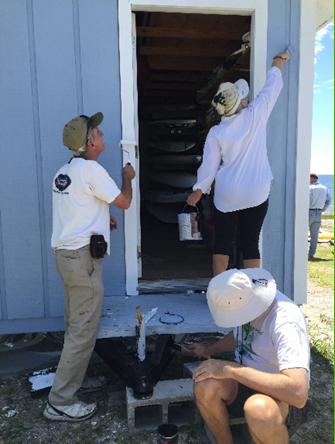 The trailer frame is now protected from the salt air and the exterior looks great thanks to the efforts of the painting crew. Now, if we could just forestall the accelerating disappearance of our beach…..
Bob G., Sandy, Perry, Joe, Rik E., Bill, Linda, Adam, Wright, John G., Stan, Baaab A., Dylan A., Mary, Rick K., and Kathy. "Supervisor Merck" even showed up on Sunday to make sure that we were doing things just right…..thanks to all. Weekend Workers! By Bob G.
What a weekend! A major task was presented, scheduled and handled thanks to many great SPSC members lending a hand. On Saturday, the trailer was prepped to be painted underneath and atop by two pressure washers, some wire scrubbing rust away, and taking the skirting off, always fun. 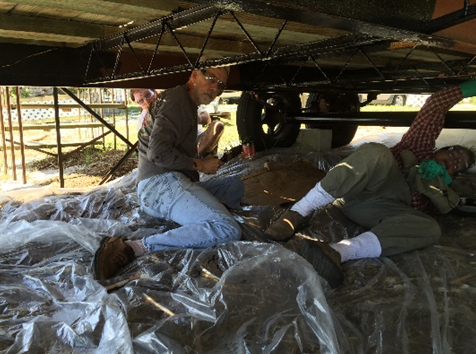 Sunday had 3 people applying Por-15 to the metal undercoating of the trailer while a slew of others painted the top, reattached the skirting, fixed some rot issues, and did other various tasks. Took a little over 4 hours, but mission accomplished! The trickiest part was getting the undercarriage ready for the Por-15. Clearance in some places was at most 2 feet, so laying on their backs, Joe and Wright tackled the job. Sunday, Joe, Rik, and Bob tackled applying the Por-15 to the undercarriage. Sadly, Bob got too much on himself, so please don’t stare at his splotchy skin. Stuff doesn’t scrub off. The weather was nothing short of perfect for a job like this, and the attitudes of the SPSCers who helped were upbeat and fun to be around. A shout out to all those who helped; Wright Finney, Joe Sisson, Rik Edmonds, Bill Olson, Adam Bennet, Rick Knerr, John Gilbert, Stan Derzypolski, Linda Downey, Mary Rolling, Mark and Kathy Voight, Sandy Layne, Bob Graves, and Bob Andrews. Because of unbeforeknownst renovations of our usual spot at Beef O ‘Brady’s, we were forced to relocate to the 4th Quarter. 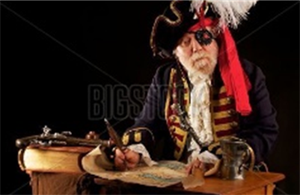 Our Illustrious Commodore called the meeting to order promptly and competently at 7:30pm. We started by hearing about how good of a trip the Midwinters were, and what awesome facilities they had at Clearwater. Keys trip – Evidence was finally found of global warming, as the soil there was perpetually soggy. Funny, since the sailors seemed to stay quite dry. Maybe they need to import more gin-infused dirt? We’re looking forward to another season of lessons, starting off with our most favorite, the Venture Scouts! It was asked about having them assist us at the Smith Regatta, and that was deferred to the regatta committee. For this year’s Summer Series, a proposal was floated of a Graves/Franklin showdown, pitting Bob’s grandkids vs the younger Franklin generation. Because, let’s face it, watching the old farts putter around a course just isn’t that gripping of an event. Wind Ceremony registration was declared open, with the schedule of the day announced. A request was made for a WC budget, approved, despite aggressive campaigning by Merk V.
R&R theme this year will be Special Olympic Watersports. We will not be inviting any real Special Olympic competitors, because they’d kick our asses. Training Trailer repairs. Wright outlined exactly what the trailer would need before the Smith Regatta. Stan and Perry had already climbed to such heights in order to fix our lightning arrestor. Did it work? Well, Perry’s hair is still quite grey, so we can’t tell. Discussion of Wakulla County’s new fee schedule, including the 10x increases. Ouch. Purser’s report. We’re not broke yet, but give it a minute. Bob A interrupted to pester about current memberships, and was roundly told to hold onto his AARP card as we’d get there shortly. 58 memberships, including the last of the band scofflaws. Bunch of slackers! 4 windsurfers are out sailing when they decide they’re hungry. Where to go? Hooters! Fine looking women. 10 years later same issue. Where to go? Endless Summer is 2 weeks before the Atlanta Fall Classic this year. Chris showed off a 3D printed tiki he was thinking of producing as trophies. There will be no extension of beach. Can not add beyond mean-high water line. 2 ft dune to be added, tapering to mean-high water line to catch any blowing sand and retain it closer to water line. Restricted access through dune. Possible golf cart prohibition, reduced to restriction after tumultuous hue and cry. You can prohibit my golf cart when you can pry it from my cold, dead hands!! Perry Morris invited those in County attendance to come by the Wind Ceremony and Smith Regatta to see how the beach was being used. Boat ramp? Implements of Mass Construction spotted in the vicinity. Not going to be finished by the Smith, but Wright has the key to the existing boat ramp. Meeting adjourned at 8:19 to considerably less hue and cry.